A SmartArt graphic is a visual representation of your information and ideas. You can create SmartArt graphics by choosing from among many different layouts to quickly, easily, and effectively communicate your message. When you create a SmartArt graphic, you are prompted to choose a type such as Process, Hierarchy, Cycle, or Relationship. 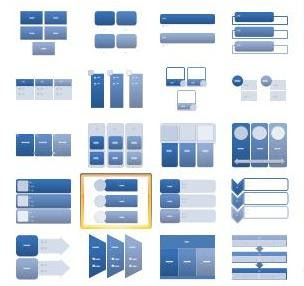 A type is similar to a category of SmartArt graphic, and each type contains several different layouts. 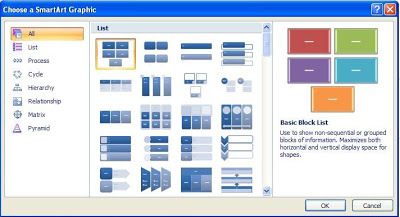 You can choose various design layout. You will show Text pane. The Text pane is the pane that you can use to enter and edit the text that appears in your SmartArt graphic. The Text pane appears to the left of your SmartArt graphic. As you add and edit your content in the Text pane, your SmartArt graphic is automatically updated — shapes are added or removed as needed. Note : Depending on the layout that you choose, each bullet in the Text pane is represented in the SmartArt graphic as either a new shape or a bullet inside a shape.